Sister and Elder Johnsen at my apartment for dinner on their last week in Palau. On Monday night two of my closest friends in Palau left the country forever. And I was not a happy camper about it. I haven't mentioned the Johnsens very much on Stranger. I'm not really sure why. They have been a huge part of my life in Palau but from your perspective that probably doesn't seem to be the case. Guys, does that make you wonder what other things I'm engaging in that you haven't heard a word about? Are you suddenly worried that I have a rock collection? Part of a boy band? A secret writer for Glee? You've crossed the line in your accusations. If I was a secret writer for Glee, I would have already "accidentally" written an episode in which the entire cast has to have a surgery where their vocal chords and faces are removed. Twice up the barrel, once down the side, Strangers. As to the other things I may be engaging in but not mentioning here, I guess you'll just have to find out all in due time. 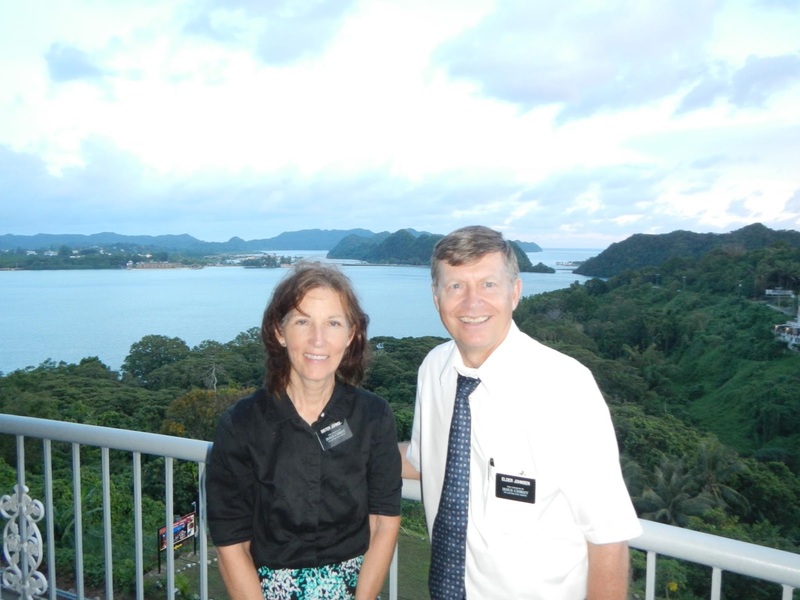 The Johnsens were Mormon missionaries here in Palau for 18 months. They worked their little hearts out, performed a lot of service, and left a huge impact on this little island nation during that time. Almost immediately upon arriving in Palau, the Johnsens took me and Daniel under their wings and befriended us. Within weeks I felt like I had known them for years. Every Monday night we got together with them for unbelievably ruthless and competitive game nights that would last late into the evening. They also helped us quite a bit in all of our assignments with the youth in the church. I loved every minute of my time with them. These are the kind of people you can talk and laugh with for hours on end without realizing that any time as passed. While the Johnsens were SO excited to finally go home and reconnect with their family, many people in Palau, especially me, have been dreading this week for months. On Monday night the church members threw a little going away party for them, just before they set off to the airport. The party was full of some typical Palau-Mormon chaos, with excessive amounts of food, lots of children running around screaming, and a dozen musical numbers, some of which were very odd, but all of which were heartfelt. They gave out hugs, took some pictures, said some words. And then, they were gone. It's been two days and I already miss them. Saying goodbye to great people is so bitter-sweet. Bitter because you don't get to see the person anymore, but sweet because the fact that it's bitter reminds you that you got to know someone special. Thank you, Johnsens, for being such great friends to me when I needed such great friends. I'm sure you had no idea how much I needed you here at the exact time that I had you. Thank you for being an incredible example to me of how to treat other people, no matter who they are or what they believe. Thank you for showing me that it's ok to feel a range of emotions, including frustration, and to express those emotions in a healthy way. Thank you for helping me understand that it's ok to have realistic expectations and to not worry so much about anything beyond that. You can't possibly ever know how much I'll miss you. But I'm so happy I got to have you here for the amount of time I did. And I'm so happy for your family who can finally have you back. I love that you are so honest about your feelings. Thank you for sharing how you truly feel with all of us strangers. P.S. they sound like really great people. I hope the sorrow their absence brings turns into happiness and more gratitude for having met them and that you have the opportunity to act like they did with you toward someone that might be needing a friend (or the Gospel in their life). Thanks for sharing. I love that you hate Glee so much. I hope that you do become a secret writer for them someday and write that episode immediately. It would be the only episode of Glee that I would watch all the way through. They sound awesome and I am sure you'll see them again! Happy travels! You know, I've never seen even one episode of "Glee". I have a feeling I am not missing much. They sound so great! We befriended a senior missionary couple in Cambodia. We didn't live in the same town, but when we came into their town they were so nice and made us delicious american food in their ac apartment. It was heaven. They left for home a few months before we did. Hopefully another senior couple will replace them? These kind of posts always make me wanna give you a huge hug. But, we've never met and I'm not sure I could just get away with grabbing and hugging you if our paths crossed. Seems like grandmas can get away with that type of thing though. I'm only 31 so I guess that gives me something to look forward too WAY down the road. You know, hugging someone you don't really know just because they seem like they could use one. Aaaaannnddd.... a little piece of me just died as I re-read what I posted and see the wrong "too". Ugh! See? I told you they were fantastic people when you moved there. They have some awesome kids too. When you get back, you should meet them.